The second BLAST Pro Series event has just ended with FaZe Clan winning the event. 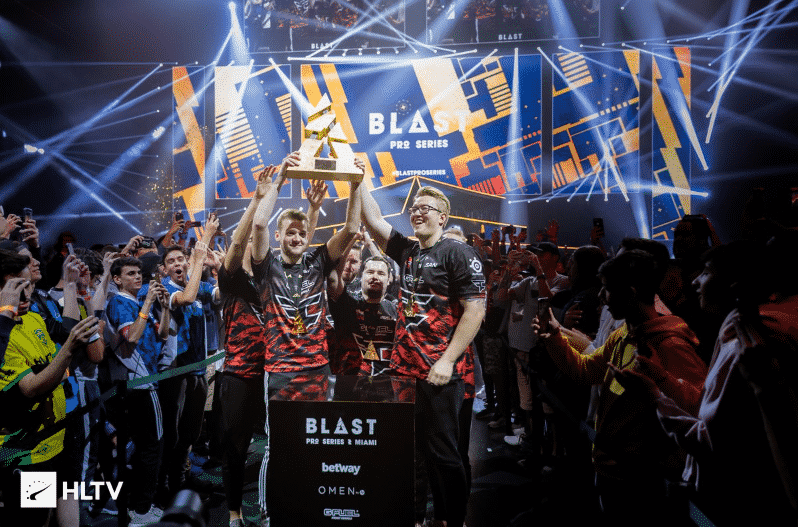 BLAST Pro Miami Champions, FaZe Clan, upset Astralis in Group Stage as well as Team Liquid in the Grand Final to lift their second trophy this year. Although Astralis haven’t lost a single game on Inferno since ECS Season 6 Finals last year, they had an opportunity to play on their second-best map twice on the first day of BLAST Pro Series Miami. Their opponents, Cloud9 and NaVi, for some reason chose to face Astralis on their second trademark map. A domestic crowd was hyped about new Cloud9 squad hoping that they could surprise someone. Nevertheless, picking Inferno against Astralis in the first round turned out to not be a good choice. The best team in the world needed just 21 rounds to earn a match point. Cloud9 managed to prolong the match by saving four match points, but Astralis eventually won the match. When Astralis was preparing for this event, they definitely didn’t expect that they were going to have an opportunity to play Inferno.. However, their opponent in the second round, NaVi, picked Inferno against Astralis as well. 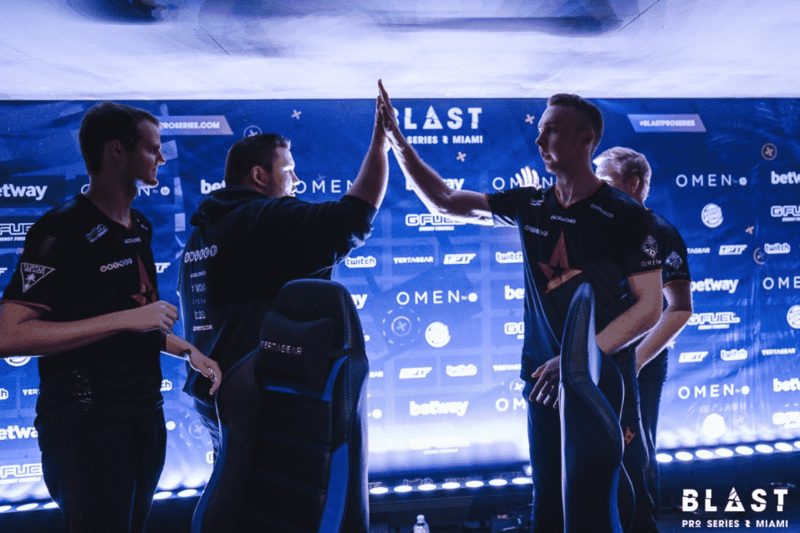 That match went even better for Astralis than the first round considering that they defeated NaVi 16-7 to win the 20th consecutive time on Inferno. The best CS:GO player of 2018 (s1mple), performed decently taking 16 frags. However, it wasn’t enough to stop Astralis on Inferno, given that all s1mple’s teammates had worse stats than him. So, everything went as expected for Astralis on the first day. In the first round, Team Liquid crushed FaZe Clan on Nuke. It was quite surprising that FaZe picked Nuke against Team Liquid as they play that map only when they have to. Otherwise, they try to avoid it. Therefore, it wasn’t surprising that Team Liquid dominated FaZe Clan beating them 16-5 in the first round on Nuke. FaZe’s In-Game leader, NiKo, was the only player with a rating above 1 on the European team. In the remaining match of the first round, Natus Vincere defeated MiBR on Nuke with ending score of 16-8. Team Liquid faced a new Cloud9 squad in the second round. The game took place on Overpass. Nitr0 and co. played well all the way up to 20th round when the score was 13-6 in their favor. In the 20th round, Cloud9 stepped up and then went on 8 rounds winning streak. They managed to take a lead even though they were seven rounds behind. Team Liquid somehow broke Cloud9’s winning streak and earned a match point. But, in the last round, Cloud9 was in a much better situation as they had 5v3 and 3v2 advantage. Anyway, Team Liquid managed to repeat what they’ve done in the last round of the Liquid-ENCE match in the previous BLAST Pro event, where they prevailed under similar circumstances. Hence, they won the last round and match to finish the first day with a perfect 2-0 score. In the remaining match of the second round, eventual BLAST Pro Miami Champions and MiBR drew a game on Mirage to earn the first point at BLAST Pro Miami. The highlights of the second day, alongside FaZe winning a title, were Astralis’ unbelievably bad results. Namely, the strongest CS:GO team in the world failed to win a single map on the second day. Moreover, their opponents dismantled them on two out of the three maps. In the third round, Astralis met MiBR on Overpass. The result was devastating for the Danish squad. After splitting the first four rounds, Astralis didn’t win a single round to the end of the game. Coldzera was playing incredibly well and Astralis didn’t know how to stop him. As a result, he finished a match with 24 kills, three assists, only four deaths and 100% KAST. It was a surprise of the tournament so far, but there was more to come. Astralis then faced Team Liquid on the same map. Although Astralis has a very positive Head to Head score against Team Liquid, the North American team was so close to defeating Astralis a few times this year and actually succeeded in doing so once in the final of iBUYPOWER Masters. They kept improving their game against the Danish team. Finally, they reached a point where Astralis was a team that looked bad versus nitr0 and his team. Astralis won the first half with the score 8-7 on CT side, even though it could be more dominant after winning 6 out of the first 7 rounds. Even though they won the first half, no Astralis fan was particularly happy because it just should have been more dominant as Overpass favors CT side. Therefore, everyone knew that Astralis had a tough task to accomplish after sides switched. Indeed, Astralis quickly fell behind after winning the second pistol round. Team Liquid set a score on 14-9. So, it looked like it was going to be another devastating loss for Astralis on Overpass. It really looked bad as Astralis failed in everything they’ve tried. But, like real champions, they didn’t give up and eventually tied. The match was so intense and it could have easily gone either way. However, Team Liquid earned a match point first. In the last round, EliGE failed to flank Astralis from behind even though he took one frag. But, he forced Astralis to speed up as they lost so much time. In the end, Twistzz and Stewie2K denied Astralis’ attempt to take B site. Therefore, Astralis had to fight for the Grand Final in the last round against FaZe Clan. In the other matches, BLAST Pro Miami Champions defeated Cloud9 and NaVi on Overpass with 16-7 and 16-10 scorelines. Also, MiBR managed to defeat Cloud9 16-6 on Cache after upsetting Astralis. Hence, the Group Standings became so complex that even casters had to do some math in order to figure out possible outcomes. 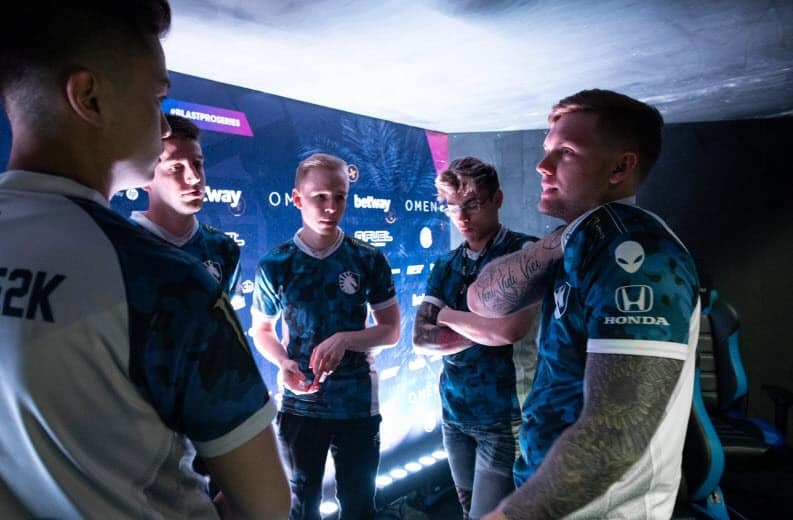 Still, two things were sure – Team Liquid secured a spot in the Grand Final after beating NaVi 16-12 on Inferno and Astralis. Plus, Cloud9 and NaVi lost any chance to reach a Grand Final in the last round where they met each other. Also Check: PashaBiceps Gets Toxic. Valve Bans Him Due to Team Kill. Accordingly, there was just one spot left and there were three teams that could find their way to the Grand Final: MiBR, FaZe Clan and Team Liquid. Basically, all these three teams needed a win and they hoped that the other team was going to lose. So, everyone expected Team Liquid to defeat MiBR and Astralis to beat FaZe Clan to book another Grand Final meeting against Team Liquid. But, FaZe Clan disagreed with that. Indeed, Team Liquid did Astralis a favor as they defeated MiBR on Overpass 16-10. But, things didn’t go as expected in the duel between Astralis and eventual BLAST Pro Miami Champions. Astralis met FaZe Clan on Dust 2. Although Astralis lost to Liquid twice on Dust 2 this year, they have been playing well on that map recently. Still, Dust 2 allowed BLAST Pro Miami Champions to show their full potential and individual skills. Astralis was struggling so badly to find their game. They just couldn’t defend against FaZe’s A site executes. It was looking like FaZe was going to upset Astralis. Danes played well in terms of tactics. But FaZe was just winning a majority of aim duels. After 16 rounds, the scoreline was 14-2 in FaZe’s favor. We even saw Magisk getting tilted after one of the lost rounds, which is very rare. It’s also not so likely to see Astralis that helpless on Dust 2. They managed to make a huge gap smaller by winning another three rounds. However, tying a score was a long shot for them. As a result, FaZe Clan upset Astralis and secured a spot in the Grand Final. FaZe upset Astralis, and viewers of the event saw Team Liquid’s reaction after they finished a match and heard that FaZe is their next opponent. NAF and Liquid’s coach, adreN, were so surprised to hear that. It looked like adreN was actually happy to hear that as Astralis is the much stronger opponent in Bo3 matches. But, things again didn’t go as expected. After MiBR winning a Pro Standoff Showmatch versus Cloud9 and taking an additional $20,000, everything was set for the big match. We already witnessed something unexpected in the map selection. After FaZe picked Mirage, Team Liquid chose Dust 2. They definitely didn’t have an opportunity to watch the highlights of Astralis and FaZe Clan match. The game started and BLAST Pro Miami Champions played so well in the first half on Mirage. Team Liquid couldn’t respond to FaZe Clan on CT side, especially on A site. NiKo and AdreN were particularly good. So, FaZe won the first half 10-5. After sides switched, the American team managed to win just one more round. Therefore, the final score was 16-6. The teams then moved to Dust 2. BLAST Pro Miami Champions kicked off the second leg on CT side. Things looked so bad for Team Liquid after the first 9 rounds. They didn’t win a single round, and rain from FaZe had a 20/0 score. He already had two Aces. At the end of the first half, the score was 12-3. ﻿ In the second half, FaZe’s advantage started melting down slowly. Eventually, Team Liquid was just two rounds behind, but FaZe stepped up for the one last time at this event and secured the last two rounds to clinch the second trophy this year. 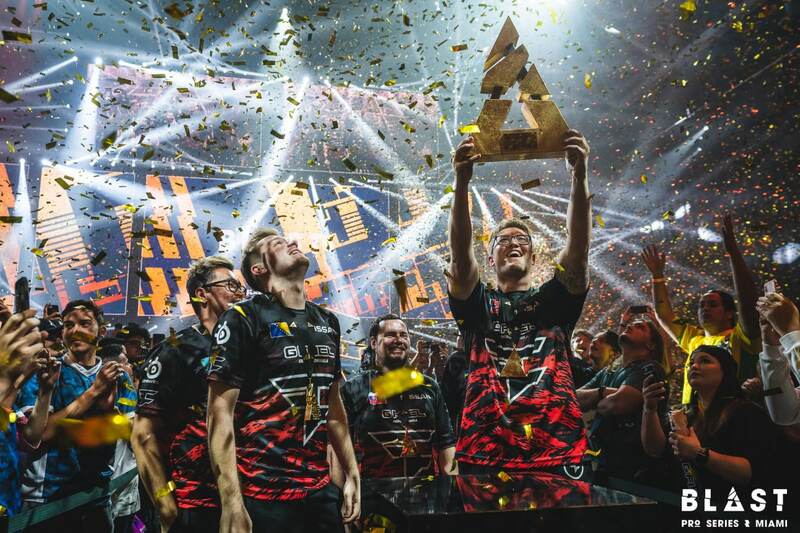 This was a great success for FaZe as they have been constantly failing to meet expectations. 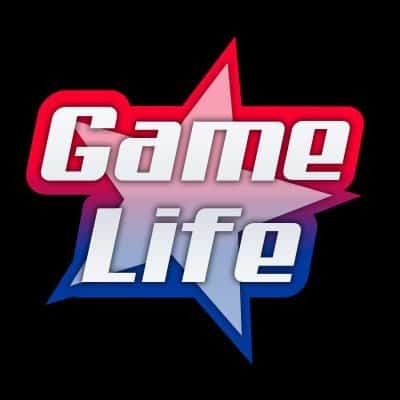 Truly, they won ELEAGUE Invitational 2019 but failed at Major as well as at the last BLAST Pro event and StarSteries tournament. They will take the BLAST Pro trophy and $125,000 home as well as 10 BPS points for BLAST Pro Global Final. On top of that, FaZe’s captain, NiKo, claimed an MVP award. On the other side, Team Liquid lost another Grand Final, but they actually have more BPS points due to Astralis’ bad run at BLAST Pro Miami. Astralis finished this event barely as a 5th team, behind NaVi and MiBR, which is going to look pretty bad in their great tournament records. A domestic team, Cloud9, ended this event as the last-placed team.